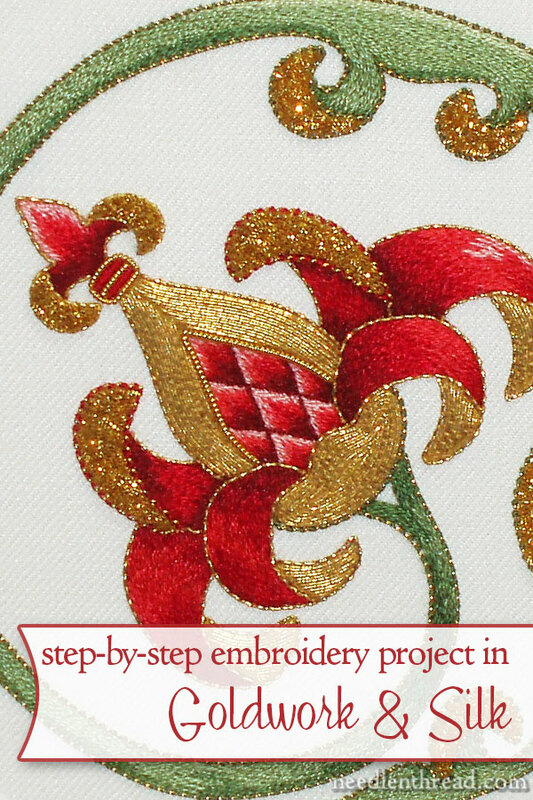 The purpose of this article is to provide an index for all the posts in my goldwork embroidery project, which features a stylized “pomegranate” or artichoke design. Almost every article in the series has some valuable tips and techniques for goldwork, so I’m hoping that you’ll find it useful to use as a reference. I began this particular goldwork embroidery project in February, 2010, and finished it almost two months later, at the beginning of April. It took a total of 56.5 hours to work, including project design, set-up, and the stitching. The finished project was framed. It is so beautiful. Like many others, I have enjoyed the Pomegranate project from the first to last day. This reference is wonderful. Greatly appreciate the thoughtfulness and effort of all you do. Many thanks. It was a fantastic project. Thank you for putting your step-by-step here for us and for gathering it into one place. Thanks for taking the time to organize those, Mary. I do indeed save these posts and make use of the tips. The "here's what worked and what didn't" info is invaluable. Gorgeous. Thank you Mary for again being such an inspiration to us all. I have a small query. I notice under the chip work you have placed a small piece of felt in a matching colour. May I ask why? and is this always necessary? Yes, if you look earlier in the series, you'll see the part where I added the felt. The gold / yellow keeps the ground fabric from being seen. It also pads the area and lifts it above the ground fabric… Hope that helps! This will surely be helpful when I start my "Golden Pomegranate" kit from Inspirations. This was a beautiful project and it was wonderful of you to share it with us. I have done just a little gold work and only wish I had your talent. Keep up the good work. Yep, that's what's happening. That will all be set up on the new site. The reason I'm building this index post right now (and another one coming up today for the rooster) is so that the pages are built before transferring to the new site. Ooh! I just clicked through from Google Reader for the first time since your site redesign, and I want to say … well, ooh! Very nice. After doing my secret garden twice and practicing say yes I can do This. I understand if you say know after seeing my secret gardens. hi Mary. I sent you a photo of my version of this. I wonder if you got it. Hi, Sarah – Im not sure? Did you send it just recently, or was it a while ago? I’ll double check! Hi Mary I hope your keeping well. I have downloaded the pattern for this piece but because I am using an iPad I am not sure it’s printed it the right size sometimes they print smaller so is it possible to give me approx measurement please. Many thanks for your time, I love your site and work. I wonder if you know why gold passing thread is called “passing”? I cannot find an answer on the Internet. Thanks. Hi, Isabel – I sure don’t, but I would imagine that it has something to do with the fact that it passes over the fabric rather than through the fabric. That would be my guess, anyway!